First read "Motion Offense". This article features some break down drills for teaching the 3-2 motion offense. These drills may involve only certain positions, and not the entire team. You may want to work with the perimeter players, while on the other end, your assistant works with the post players, or vice-versa. Many of these drills are applicable to any motion offense... 3out-2in, 4out-1in, 5out, etc. and help teach players how to "play the game". After running some of these drills, we like to go 4-on-4 or 5-on-5 half-court to reinforce things. We make our 4-on-4 and 5-on-5 drills competitive with losers doing push-ups. In all of these drills, we really stress that our perimeter players get into triple-threat position when receiving a pass on the outside. Teach your perimeter players to V-cut, replace themselves, and receive the pass. Make sure they catch the ball in triple threat position. Use groups of three, and start with no defense, or token defense (no deny). The players reverse the ball around several times. Then you yell "Go! ", and anything goes with the offense attempting a quick score, using a dribble move, a cut and pass, screen, back-cut, etc. After teaching the V-cut, teach the back-cut, which is used when the defender over-plays, or denies, the pass. Have your X2 defender deny the pass, and teach O2 to recognize this situation and make the back-cut for the pass from O1. Initially, use token defense, and then go 2-on-2 with hard defense. The O2 offensive player must learn to read the defender, and learn when to v-cut, and when to back-cut. Again, use the 2-on-2 setup. The X2 defender plays "soft" and allows the pass from O1 to O2. O1 fakes left, and makes the basket cut looking for the return pass from O2. Have the X1 defender play token defense at first. Then "go live". If the X1 defender over-plays the passing lane (because he knows the drill), then the point guard can fake the cut and pop back out for the pass and outside shot. If the X2 defender "cheats" toward the passing lane, then O2 can fake the pass, and dribble-penetrate to the hoop. Now teach that if O1 is not able to make the pass to the wing, he/she may simply dribble to the wing and replace the wing. The wing player must recognize this, and then back-cut to the hoop. He/she may cut all the way through to the opposite wing, or can button-hook at the low block and post-up the defender down low. The opposite wing replaces O1 at the point. Rotate around several times (go left also) and then yell "Go! ", and finish the set with a pass to a cutter for the lay-up or shot. We have a rule for perimeter players that whenever a teammate is dribbling at you, you must back-cut out of the area. This drill works on this concept. The first part of this drill is similar to the dribble-entry drill above. O1 dribbles at either wing. The wing back-cuts out to the opposite wing. If open, 1 can make the pass to the cutter. Otherwise O1 can pass back out on top to O3 and O3 can then dribble to either wing and continue the drill. In diagram B, we have the wing player dribble toward the top, and here O1 fakes a cut outside and then quickly back-cuts. O1 either receives the pass on the back-cut and scores, or moves back out to the vacated wing spot. We want our guards to be aggressive and attack the seams between the defenders, and learn when to "go" and when to kick the pass back outside. We start with the ball on the top and O1 tries to attack the seam between the two defenders. Meanwhile, when O2's defender drops to give help against the dribble-penetration, O2 should slide toward the corner. O1 has the option of going in for the lay-up, or kicking the pass out to O2 in the corner. If O2 gets the ball in the corner, he/she has the options of (1) shooting the 3-point shot, (2) a shot-fake and one-dribble jump shot, or (3) attacking the seam for a lay-up. When attacking the seam, O1 should already have sprinted back out to the top, and may receive the pass from O2 if the defenders hedge and stop the drive. Now O1 has the same three options. In this drill, we don't allow the offense to attack the baseline or attack outside the seam. Notice that this is also a good defensive drill for learning to give help and recover against dribble-penetration. We run this drill on both sides of the court so that our point guards get proficient at attacking either the right or the left seam. We don't want our perimeter players just standing still. When our wing players (O2 and O3) feed the low post, we want them to slide to the corner. Oftentimes, the wing defender will momentarily drop down toward the post or turns his/her head and for a moment loses sight of our wing. We have the wing slide to the corner as this is an easy pass back out of the post and is often open for the 3-point shot from the corner. Similarly, if the ball is passed from the low post back out to the point, then our wing must slide back up. In diagram K, we have our wings get in triple-treat, curl bounce pass to the low post, and then slide to the corner. Our post passes back out to the corner and the wing shoots the 3-pointer from the corner, gets the rebound and goes to the opposite side. We run this drill on both sides. In diagram L, the wing again curl-bounce passes into the post and slides to the corner. Now the ball is passed back out on top to O1 and the wing slides back up, gets the pass from O1 and shoots the 3-pointer, rebounds and goes to the opposite line. Also see Feed the Low Post Drills. Again, use the 2-on-2 setup with a post and wing offense and defense. O1 has the ball and passes to O2, and O2 will make the bounce-pass into the post. We run this drill "live" so O2 must make a V-cut and get open for the pass from O1. O4 must post up inside while the defense tries to deny the pass inside. O2 may have to make a one-dribble adjustment to one side or the other to open a passing lane. But first we want O2 to catch ball in triple-threat position and look into the post before putting the ball on the floor. We want O4 to post up aggressively and call for the ball. O4 makes a post move and finishes strong. This is also a good chance to work on boxing-out and rebounding... finish the drill! Rotate players after two possessions. Again, use the 2-on-2 setup. O1 has the ball. O2 comes from his wing and sets a screen for O1. O1 dribbles around the screen to the hoop. O2 seals the X1 defender and rolls to the hoop. For correct screening techniques see "Setting Screens". Also reverse the rolls. Have O1 pass to O2 on the wing and then follow his pass and screen for O2. 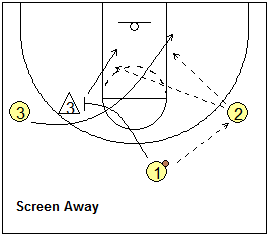 O2 goes around the screen and takes it to the hoop, while O1 seals and rolls to the hoop after the screen. Teach all your players correct screening techniques with this drill. Use three lines. 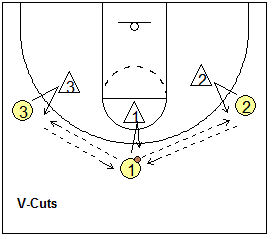 O1 passes to O2, and "screens away" for O3 on the opposite wing (use a coach or manager as a token defender). O3 rubs off the screen and cuts to the hoop. Make sure that O3 waits for the screen to arrive, and that O1 sets the correct angle on the screen. Also, make sure that O1 seals the defender, and then rolls to the hoop after O3 cuts around the screen. O2 can pass to either cutter. Although not shown in the diagram, have O2 make a v-cut to receive the ball… again reinforcing that there is no standing still to receive a pass. Teach your wings how to down-screen for the low post. The low post player curls around the screen for the pass and jump shot. Work both sides of the floor. Start with the #5 defender playing token defense, and progress to hard defense. Teach the low post players how to correctly back-screen for the wing. The wing behind the screen for the pass from O1. Show token defense at first, and have the X5 defender let O3 cut to the hoop for the pass and lay-up. In this case, have the X5 defender switch on the back-screen and pick up the cutter O3. O3 recognizes that he/she is covered and moves out to the opposite short corner (for spacing). Meanwhile, O5 who has screened the X3 defender, also "pins" the defender thereby gaining inside position. O5 rolls to the hoop for the pass and lay-up. Again, start with token defense. Then progress to hard defense allowing the defense to either fight through the screen, or switch. In either case, the offense must learn to read the defense... if the switch is made, use the back-screen pin. Teach the wing players to try to make the pass to the low post when the defender is playing behind. You can also place a defender on the wing player, so the wing has to "step-around" to make the pass. O4 must get wide with arms out to receive the ball. Once the pass is made, the opposite post should move to the high post, to allow spacing for O4 to make the post move on the defender. Have your low post dead-fronted. Teach O5 to recognize this situation, and then flash to the ball-side high post position to receive the pass from O2. O4 should "pin", or seal, the defender and get inside position for the pass from O5. Have all your post players take turns, to learn to recognize this situation. The other option to be practiced here is having O4 pin the defender and "step-off" toward the hoop for the high lob pass from O2 to O4. This is a key part of our "High-2" play. Now use three perimeter players to rotate the ball (you can have them v-cut as in drill #1 above). The two offensive post players learn to work together, reading the defense as learned above, and work on screening for each other also. When they receive the ball in the low post, let them make a post move on their defender. Use token defense at first, and progress to hard defense. Your post players must learn how to screen for each other, and how to "pin" the defender after the screen, for inside position. This is very important for getting easy, inside baskets. See the diagram below. If the ball-side post player cannot get open for the pass, he can screen away for the opposite post player, who comes to the ball. If he does not receive the pass, or if the defense switches on the screen, he can move out to the short corner (for spacing), Now the other post player should have inside position if he correctly pinned his defender when setting the screen. Incorporate these concepts in the "Posts 2-on-2 Drill" above. Bad passing, turnovers a problem? Use this drill. Playing in the half-court, teams go 3-on-3. The offense must make 10 passes without losing the ball, or making a turnover (double-dribble, traveling, etc). Offensive players must pass, cut, dribble, screen, move, maintain spacing, etc. The offense does not shoot or attempt to score, but maintains control of the ball for 10 passes. Rotate offense to defense. If the offense completes 10 passes, they don't have to play defense that rotation. This drill will help teams prone to turnovers and bad-passing. Use this drill every other practice and players should become better passers and your team should see it's turnovers/game decrease. Be innovative! Create your own drills to help teach the "motion offense". Rather than a lot of set plays, teach your players how to fake and cut, screen, pass, go backdoor, feed both the low and high posts, etc. Go either 4-on-4 or 5-on-5 and make losers do push-ups. Make sure perimeter players are getting into triple-threat. They should execute the cuts and screens outlined above. You can set some rules. For example, one time, tell them that no-one is allowed to shoot until at least two screens have been made... you count them out loud from the sideline. Another time, they are not allowed to shoot until the ball has gotten into the low post at least once, and then into the high post another time. Another time, the rule is no dribbling... only passing. The only dribble permitted is a one or two bounce dribble inside for the lay-up. Any "unnecessary" dribbling on the perimeter, and the other 5 is awarded the ball. This is fun for your players. Keep score, alternate possessions, and make both teams play under the same offensive rules that you impose. The players will enjoy this and instead of learning set plays, they will start learning basic motion offense and how to "play the game". with Jay Wright, Villanova University Head Basketball Coach.